Welcome to my second tutorial! This one will be about how to add effects to sounds/synths in fl. I'm not going to go over all the effects, just enough to get you started. And i'm going to assume you went through the first tutorial so i dont have to cover the basics again. 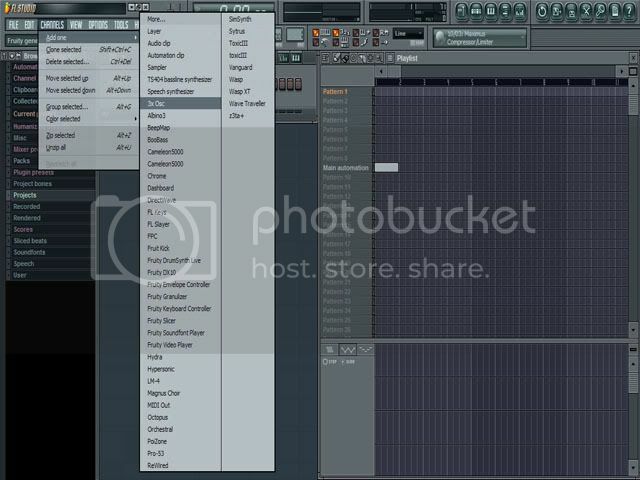 This tutorial wont cover all of the effects and how to use every aspect of them, no, this just shows how you add effects to sounds and use them.. In this tutorial i'll show you how to make a very cool 3xOsc Saw sound by using Effects and the 3xOsc, we'll start with the 3xOsc. I dont think i need to explain the 3xOsc synth again, but if you need to remind yourself what it is, go check out the other tutorial. Set the 3xOsc synth like this, and make sure all the CRS are tuned correctly, this will sound horrible if not. You dont need to move the middle slider, just the top and bottom one. Tune them exactly to the position the middle one is. When you've done that, try the little keyboard (piano) on the bottom of the synth and see how it sounds. it should have a very technoish sawy sound. But it lacks the key part of it all, the effects. now i'm going to show you how to add effects on stuff. In the left corned of the 3xOsc synth is a little button, click it, and then click "assign free mixer channel"
Try doing something in the piano roll for the 3xOsc now.. i know.. not exactly very cool, but that is because we havent tuned the effects correctly. When you selected the effects, they should have opened, if you closed them or for some reason they didnt open, you can open (and close) them by clicking their names in the mixer. Tune all the effects correctly, when you have done so, you can save the presets by clicking the little button in the left corners of the effect and select "save preset"
The reverb effect gives an Echo'ie effect to the sound, it can be used to make the sounds very good, add on the quality and make the song not sound to flat, but beware, it can also mess up your songs if used badly. The paramedic Eq effect gives you the ability to controll the high and low frequencies of the sound, very important, can often boost the quality. 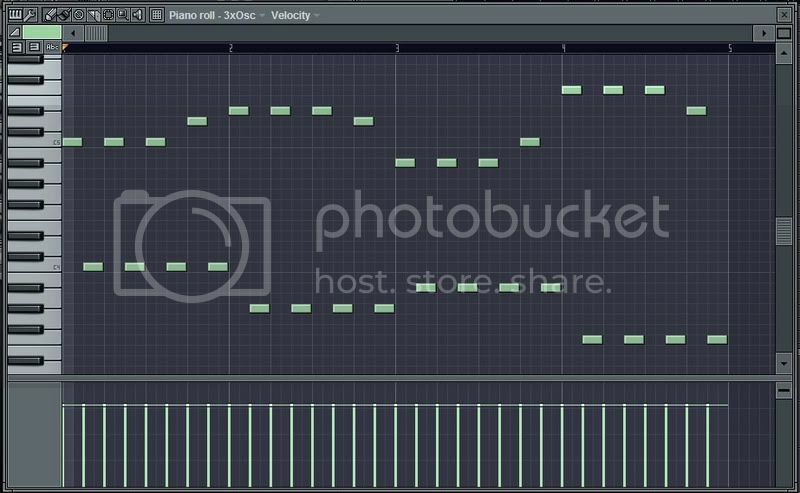 Now try something in the piano roll, doesnt this sound amazing? if not, then go back to the point of this tutorial where i told you to tune the 3xOsc correctly, one or two of the crs might be off. All right then, now you know how to add effects to stuff in fl. 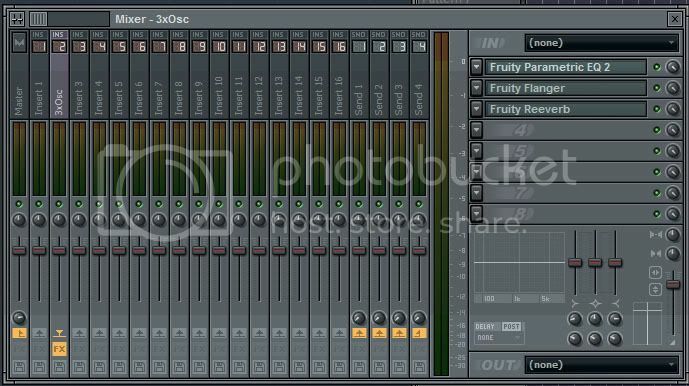 Now go play around with the effects and the 3xOsc, and remember, you can add effects to any sound you'd like in fl, anything, not just synths..
My next tutorial will be about going even deeper into the 3xOsc, i hope to teach all i know about it..
Out of curiosity which plugins did you buy with FL Studio? I just bought the SoundFont one so far. 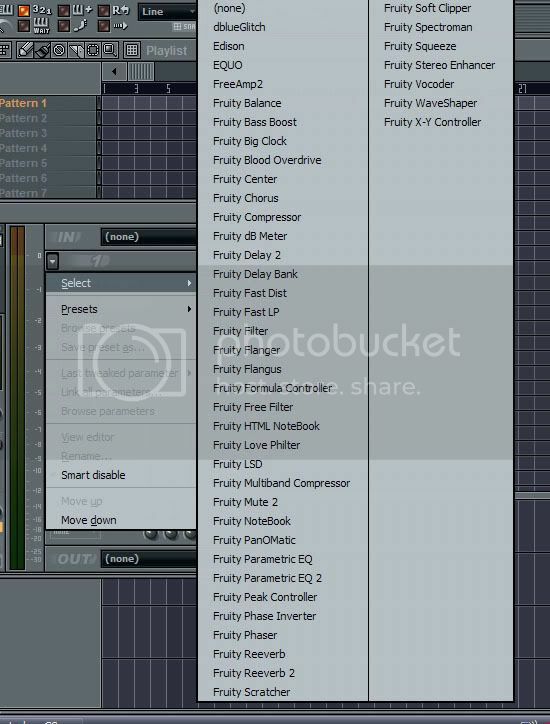 Quote: "Out of curiosity which plugins did you buy with FL Studio? I just bought the SoundFont one so far." I've also bought the Z3ta+ synth, it can come in handy when you're making electronia songs, but i dont use it anymore, i just use the 3xOsc, wich can do anything the Z3ta+ can, you just need to know how to use it.. I also bought the Wasp synth.. i regret that. 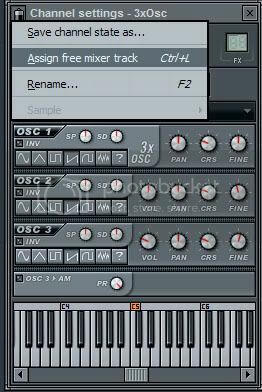 I bought it when i was a beginner using fl, i thought it was very easy and very nice, but now i know it's just a very very simple (worse) edition of the 3xOsc.. There might be some i'm forgetting, but i think this is all. Well that's about it, i've also got a few trial versions of synths, none that i like. But when you're thinking about what synths to get you need to think about what genre of music you want to make, like if you want to make orchestral music then buy a orchestra synth, if it's techno you want to make, get some synths that can produce good techno sounds, and so on.. What i said you've probably realised yourself i dont really know why i had to point that out, but it's very true, some synths are more for pads/basses/SawLeads and you just have to think about what you feel like you're missing, and would like to be able to do, but cant because of the lack of a certain synth or sounds. Quote: "I just bought the SoundFont one so far." yeah, the soundfont player is probably the only vsti synth that's usefull you get from image line i havent bought it yet because i havent had the need to use soundfonts, maybe i'll check it out more later. 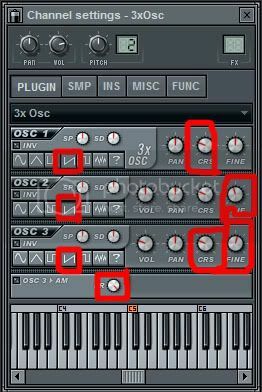 In my opinion image-line overprice their stuff, for example the DirectWave plugin costs 99$$, 99$ for a stupid sampler. that's crazy. i know they have cheap synths like dx10, wasp xt, and those really old synths and there's no reason to use them..
Woah, thanks a lot Lucifer! The main part I want to learn about is the 3xOsc synth. I'll read it later today! Quote: "Woah, thanks a lot Lucifer! The main part I want to learn about is the 3xOsc synth. I'll read it later today!" Quote: "thanks a lot Lucifer!" haha, i just realised how funny that sounds "thanks satan!" I read through your other tutorial, and it's helped me greatly! Flanger is when you when several slightly detuned versions of the same sound are played at once. As the waveforms slowly allign and seperate it creates that sweeping sound. Quote: "@Lucifer - How did the EQSL turn out? 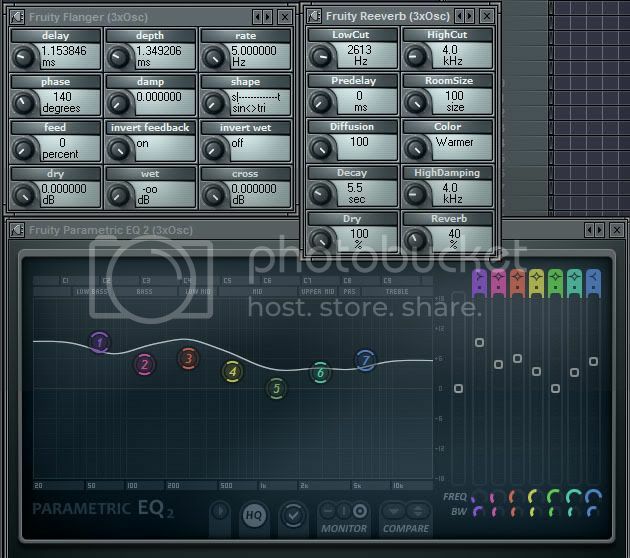 Can you use it as a plug-in for FLStudio? I was looking here and am really impressed with the sound quality in the music samples "
It's a great synth and i'm sure if you're interested in making orchestral music, you wont be disappointed with this one! 8-o Jeku you changed your sig! Crazy! "A West Texas girl, just like me"
Nice tutorial, very well written. Are you planning on making more? Anyhow, I've attached what I came up with (IE: your stuff) after reading both tutorials. thanks and yes i will make some video tutorials i think i'm going to have it in chapters, and each chapter explains something new, and in the first chapter you'd like start a new song, and then work with that song throughout the video tutorials and in the latest chapter, you'd have a full song, i doubt i can have only one tutorial explaining everything. Edit: I just found out why camtasia wont let me record the microphone and what's happening on my pc at the same time, i think, so i guess i'll have to find another program to record the screen with..
not allowed for use in fpscreator projects without my approval.. I canot DEAL WITH THIS!!!! !